School Sister of Notre Dame Virginia Muller grew up rooting for the Dodgers at Ebbets Field in Brooklyn, N.Y. Ministering in Baltimore, she has more recently adopted the Orioles as her hometown heroes. But ask who her favorite player is and the white-haired religious sister turns to a Pittsburgh Pirate from another generation. “Honus Wagner!” Sister Virginia exclaimed with a laugh. 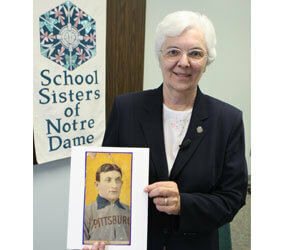 Sister Virginia spoke during a Nov. 5 press conference at her religious order’s motherhouse in Baltimore, announcing that a rare 100-year-old Honus Wagner baseball card bequeathed to the School Sisters of Notre Dame brought the School Sisters $220,000 in an online auction that closed Nov. 4. The card, graded authentic though in poor condition, was left to the School Sisters of Notre Dame’s Atlantic-Midwest province by the brother of a School Sister. The sister died in 1999 and her brother died earlier this year. He left everything he had to the congregation, including the card, which surpassed initial estimates of its auction price by $162,900. Sister Virginia, former treasurer of the Atlantic-Midwest province, was the personal representative of the donor’s estate. Sister Virginia remembered that when she opened the safe deposit box, she had no idea who Honus Wagner was. “I did take myself to the Internet and to the library to quickly find out some things about Honus,” she said. After news of the card began to circulate across the country, Sister Virginia received a telephone call from South Carolina. It was Leslie Roberts, Wagner’s granddaughter. “She was absolutely thrilled that the School Sisters had this card and will be receiving such a gift,” Sister Virginia said. Sister Virginia noted that Roberts recounted how her famous grandfather sat her on his lap while chewing tobacco and feeding her bits of Hershey’s chocolates. The retired baseball star enjoyed telling tall tales and once explained to his granddaughter how he hit his longest homerun when he smacked a ball out of the park and into a train heading to California. “We are grateful to benefactors like the one who gave us this Honus Wagner card because such generosity enables us to continue our ministries,” Sister Kathleen said. Doug Walton, managing partner of Walton Sports & Collectibles LLC, won the auction for the card. The final price, including a buyer’s premium of 19.5 percent, was $262,900. Asked whether she thought there was divine intervention in the way the card came to her order, Sister Virginia smiled.